A spacious, well appointed apartment in a central location. A 70 m2 large vacation apartment (large entrance hallway, 1 bedroom, 1 living room, kitchen/dining room, bathroom). It is very well equipped and completely furnished with wardrobes, microwave, oven and 4 ring ceramic hob, cable TV and Wi-Fi, CD video player, DVD player, dishwasher, a wash/dryer machine, hair dryer, iron and a lot more. Ideally situated only 2 minutes walk from the historic old town of Krakow and close to other attractions. The apartment is on the second floor. Fabulous home in convenient location! As advertised. Spacious and convenient to Krakow’s town square. Owner is very responsive and helped us, first time visitors to Krakow and Poland, find what we needed. Would definitely recommend this rental for a fun time in Krakow. Spacious, clean, comfortable apartment in a great location. Short walk to trains, buses, shopping, covered market, and the old town center. We even went to the cinema just 1 minute walk away on a rainy afternoon. The apartment is very well equipped and the kitchen has some basic supplies so you don't have to buy everything. The fan was much appreciated for the hot weather. We enjoyed the music from the school across the street too and can confirm there was absolutely no dance studio noise over our heads. We enjoyed the free Walkative Jewish Quarter tour and here's a tip if you haven't got a Schindler's Factory reservation. The Walkative tour ends at the Factory and you can go in with the guide without a prior reservation. You pay extra as the guide accompanies you. Krakow is a great city to visit, so compact, and with the great park (Planty) circling the old town. So nice to walk pleasantly everywhere with little car traffic in the center. And we also enjoyed the Rynek Underground. It's much larger than you think at first and we liked the later exhibits best so save energy to get through all of it. 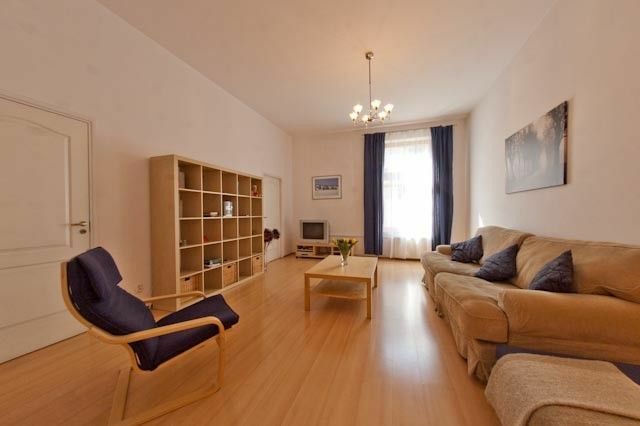 Very spacious and very well equipped contemporary apartment and a very helpful owner. This stunning apartment is just a six minute walk to the centre of Kraków’s famous medieval square. The historic walled city, encircled by the shady Planty (gardens) and the Vistula River, is one of the outstanding medieval cities of Europe. It is very easy to explore on foot and has a wide range of bars, cafės and restaurants to choose from. Most visitors will of course be aware of the main historical attractions, Wawel Castle, Jagiellonian University, Schindler’s Factory, the Kazimierz, and the Cloth Hall, but may be as surprised and delighted as I was with the recently discovered Roman city beneath the square. All in all the perfect city break! Very roomy. Everything you need. Clean, comfortable, convenient, and very well equipped. Barbara was very helpful and check- in was flawless. We hope to stay here again. Pictures didn't give this apartment enough justice. It was very spacious and warm. Location was perfect. Barbara was helpful through the whole process. I highly recommend.